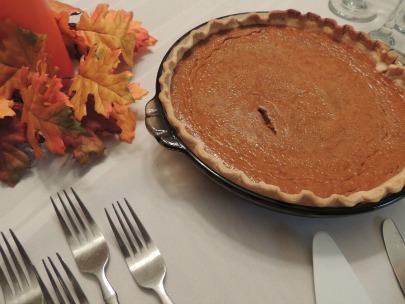 Thanksgiving dinner preparations can stuff your energy bill with unexpected costs. Follow these simple tips for a worry-free feast. Recipe courtesy of Charlotte Merckens. Ceramic or glass pans: These heating champs allow you to turn down the oven and keep cooking even after they’re out—shortening cooking times and making room for you next item. Lids: Covering stovetop foods lets them heat up fast, saving time and energy. Speed things up even more by using the highest heat to boil water. Turkey: Thaw your turkey in cold water instead of the fridge. Refrigerators work harder and consume more energy while warming up your bird. Another turkey tip: make sure you get the right size bird for your party. The bigger your butterball, the more energy needed to prepare. Cooler or Ice Bucket: Set up beverages outside the fridge so guests don't have to open the door each time and let cold air out. You can even make your cooler part of the décor if you’re feeling especially festive! Turn down the heat. If you’re cooking for a (small) crowd, body temperatures and heat from the oven will more than cover your thermostats usual job. Schedule dishes that can go side-by-side in the oven. Keeping your oven on for a shorter time and at a consistent temperature means it will use less energy. If you’re going to peak, use the oven light. Turning on a light to save energy may seem counterintuitive, but admiring your food without opening the oven wastes less energy. Leave out leftovers until they’re cooled. Hot foods are more work for your fridge to chill. Speaking of leftovers…don’t overstuff your fridge and freezer. Too many items can make them run less efficiently. Put appliances to work. Microwaves, dishwashers and crockpots can be more energy efficient then their analog alternatives. Run dishwashers late night—off peak hours-- when guests have gone for more savings. Visit Edison Electric Institute and the Department of Energy for more energy-efficient holiday tips. Happy feasting!